In August, our family was blessed with the amazing opportunity to visit the Creation Museum in Petersburg, KY. It was humbling, spiritually educational, and just plain AMAZING! After only a short time from starting the museum walk, my 4 year old daughter announced, "I LOVE this place!" The excitment and thrill never ended the entire time we were there. After talking with several of my friends, I decided a post would be benefical with my review and suggestions for a trip to the Creation Museum. 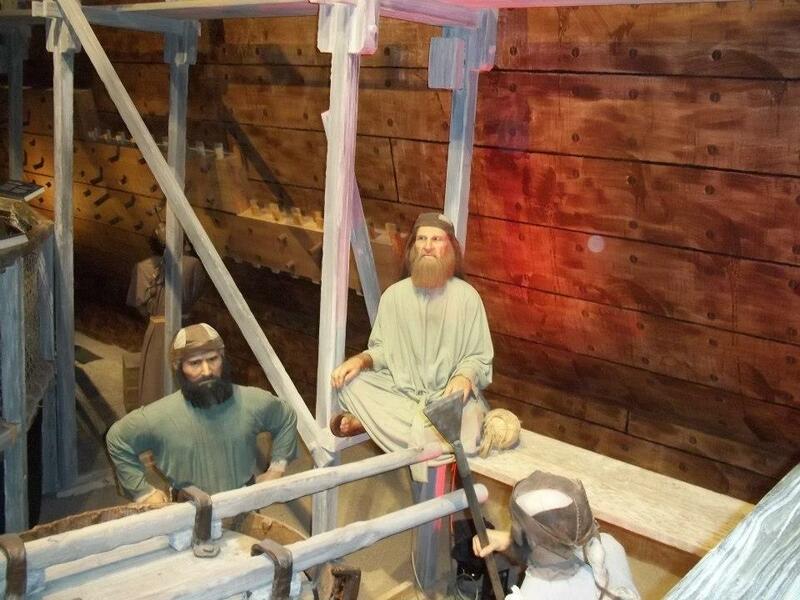 This is a scene from the Noah's Ark exhibit. Each ticket you purchase is good for 2 days at the Creation Museum. Arriving at the museum when it opened and having young children, we didn't feel 2 days was necessary for our trip. Now, with that said, after I got back to the room and really looked at what all they had to offer, which I could have easily read in the pamplet they handed me as I walked through the door that is specific for that day's events, I regret we didn't stay longer. So, I am hopeful to return again one day soon! Other than the walk through museum, they also offer Question and Answer workshops, several videos to watch, and short movies, all included in your ticket. The beauty of it all though is you can do as little or as much as you want... all in your own time. You may want to come and just do the museum walk through, and the gardens in one day. For your second day, you could easily schedule your time in the planitarium, and see the various shows they offer, and hopefully take in some of the workshops... and if you're anything like me, go back to a few of your favorite spots in the museum to reread things. The gardens at the museum are a site alone! So peaceful. Pack a picnic lunch for your family and have a family picnic under the beautiful pavilons in the garden. As you keep walking, you will incounter various swinging and floating bridges = fun for kids. Also, the free petting zoo is located towards the back of the gardens. Next to the petting zoo, take some time to ride Gomer, the camel for a slight extra fee. My kids LOVED the camel ride. Don't forget your camera, you'll want a picture of this! I highly recommend going to the Creation Museum's website page for a detailed explanation of all the exhibits they currently have. Many new exhibits have been added since my visit. Currently, they have one on dragons, insects, Verbum Domini (The Word of the Lord), The Dig Site, Dinosaur Den, The Last Adam, and many, many more. My family loved the Dinosaur Den and the way they set it up with the Q & A. With each answer, my son would ask another question, which many times, was the next topic of discussion. I encourage all of you, as you do your walk through tour, starting with Creation, take time to really read about the 7 C's of History. If you are familiar with Answers in Genesis, you may already be familiar with the 7 C's. Here is a link to help explain them to your children. If you or parts of your family are thrill seekers, unlike myself, then you may be interested in the Creation Museum's new addition this year, Zip Line and Canopy Adventure Tours. They say it's the biggest and best in the Midwest! The Dragon Hall Bookstore has a vast supply of every type of book imaginable, in my opinion, on the topics of creationism, dinosaurs, and many other important subjects, all with a biblical perspective. Homeschoolers, you can pick up great Christian science and Bible curriculum in the bookstore as well. This is just a very brief overview of the museum. I did not even mention the planetarium, the theatres, or the workshops that they have going on throughout the day while you visit. Before visiting, I suggest viewing What's Here to read more on what they will be offering for the specific time you plan to be there. As you can see, there is so much to see and do at the Creation Museum, it makes for a wonderful trip for the entire family!